Today was the first day of Tech. For those of you not familiar with theatre, tech week is when all of the technical details of the play are tuned and set in time with the action of the play. The lighting and sound cues are created, and if the set has any moving parts, turntables, lifts or things that fly in from the grid, this week is when we work out the bugs. Picture those scenes in movies about theatre where everyone is rushing around a mostly finished set each intently focused on his or her task, that is what our theatre looks like right now. The sound of a theatre about to go into tech is fabulous and it changes in an almost physical way as you move around the theatre. The monitors pick up the sound of 16 different important conversations onstage and project them backstage creating a hum of communication that reminds me of bees. The effect as you travel down the voms into backstage is that of an auditory curtain that reinforces the sense of transit between worlds. During load in the theatre is not exactly quiet, but the sound on stage is more likely to be the whine of power tools than the buzz of voices. Once tech starts the number of people in the theatre increases threefold and work starts to feel more like a busy family gathering. The community at ACT theatre is wonderful and it’s a big part of why I enjoy working there. It seems like a cliché to dread tech week, in much the same way that students dread finals, but I actually love it. The energy on set is high and I get to see all the things we’ve been working on for the past few months come to life. Though I have to I admit I’m not actually required to attend tech rehearsals. If I were I might feel a little differently since, for the production crew, tech rehearsals start early and go late. For those in the shops, once the actors take over the set we head back to the shop to clean up all the leftovers from the load in process, get ready for the next show and wait for notes. Here’s what a day in tech looks like for me: I start work at 8AM, just like normal. We have access to the stage from then until around noon when tech rehearsals start. The morning is usually filled with work generated by notes from the previous night’s rehearsal. Once rehearsals start the we usually clean the shop and get ready to build the next show. Some time in the afternoon the assistant technical director comes up from the theatre to tell us whether there will be dinner notes or not. If there are notes it means we’ll be working until 6:30 so we can work on stage while the actors and crew take dinner. Perhaps it’s obvious, but this is the stage floor after we finished laying down all the planking. It looks even lovelier in person. Doing dinner notes feels the way I imagine it feels to be the pit crew of a race car. Just before the actors break for dinner we gather backstage with our tools and materials in hand, waiting for the all clear to take possession of the stage. Once we’re given the go ahead we swarm out and set to our tasks knowing that in a relatively brief time we have to finish whatever we’re doing, then clean up and leave the theatre in a rehearsal ready state. Today’s dinner notes involved chasing squeaks out of the floor. 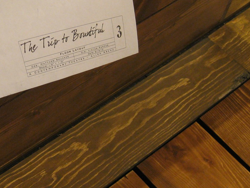 The pine boards that make up the floor for The Trip to Bountiful are beautiful, but planks have a lot more personality than manufactured wood like plywood or MDF, and that personality can sometimes make my life a little more difficult. A self portrait, a carpenter and her tools waiting for dinner notes. But how did we arrive at the first day of tech? And what is The Trip to Bountiful about? Tomorrow I’ll write about building the set and tell you a few of the tricks you’ll see when you come to see the show. I won’t tell you everything of course, some things are better as surprises. A. G. Quinn is a mixed media sculptor who also designs and builds for Theatre and Film. At work she builds things that fill entire rooms and at home she builds rooms that fit in your hand. She lives with her husband, daughter and two cats in rainy Seattle. She writes about her adventures here and hopes you will find them engaging.